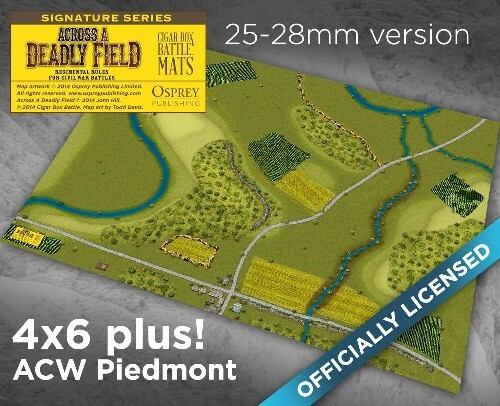 Cigar Box Battle and Osprey Publishing are proud to bring another "Across A Deadly Field" scenario to your table-top - the Battle of Piedmont - Hunter takes Command, May 21, 1864". This is the artwork from the "Across A Deadly Field - the War in the East" Osprey scenario book. The original artwork was designed by Dean West and Todd Davis for Dean's scenario "Hunter takes command - Piedmont". This is the scenario mat for the classic battle between Gen. "Black David" Hunter and Gen. William "Grumble" Jones. The large scale 25mm - 28mm version (#140B), plays well with 25mm figures using "Across A Deadly Field" at 1 inch = 60-80 yards. It would also work well for 15mm Johnny Reb, Regimental Fire and Fury, and many other regimental ACW rules. The 25mm mat comes printed on a full sized mat (4x6 plus).